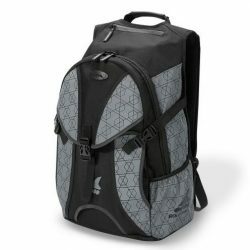 Pro Backpack is a well thought out and versatile backpack to accomodate skaters and their needs wherever their travels with skates take them. It features an updated external system of carrying and covering the skates. The skates are strapped onto the back of the bag with the wheels facing each other and the bottom support flap has a cut out to fit brake pads or larger wheels on the 3WD models. The bottom flap also covers the dirty wheels and secures the skates to keep them firmly on the backpack. The upper flap covers the top of the skates and adds more support and security. There is a helmet clip conveniently located on the top of the bag to maximize internal space. Some skaters bring a change of clothes or gear depending on where they skate and the wet compartment on the bottom is ideal for this. Sweaty, dirty clothes can stay isolated from other clean items in the internal space. The padding on the shoulder straps and back make the bag very comfortable and provide ventilation on the back where most of the contact with the body is made. Plenty of storage space, water bottle pockets, reflective piping for safety and YKK zippers with custom pullers add to this premium bag that is definitely an item any skater would love for its rich aesthetics and functional appeal.